Any and all claims and/or disputes of any kind that in any way relate to, arise from or are in connection with any item sold by or listed by UpperWatches or your purchase or attempt to purchase any item from UpperWatches shall be governed by the laws of the State of California and shall be litigated, if at all, solely and exclusively in a court of law within Los Angeles County, California, to the exclusion of any other court where suit might otherwise be brought. UpperWatches shall not be held responsible for any damages other than the actual price paid to UpperWatches for the item purchased and purchaser hereby waives any and all claims for additional losses incurred. Purchaser shall be defined as any person or entity that purchases, attempts to purchase or claims damages of any kind which relate to, arise from, or are in connection with any item sold by or listed by UpperWatches. 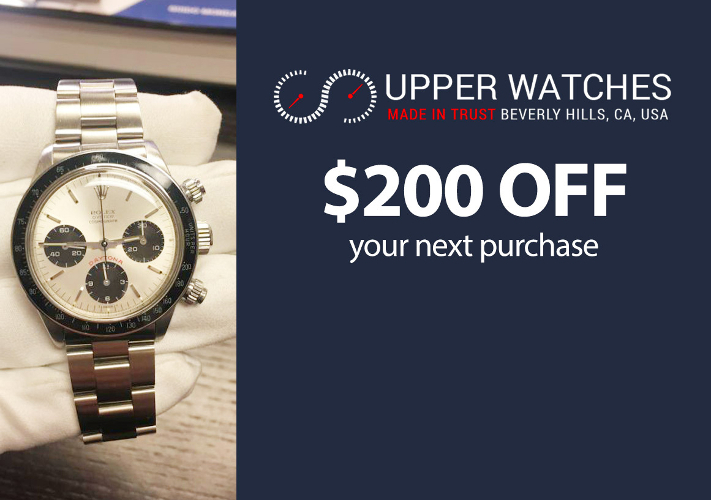 UpperWatches reserves the right to decline any offer, or to not sell a particular watch at any time. UpperWatches will not be responsible, or held liable for any mistakes to listings or misprints made by UpperWatches representatives and agents.